Hi, this is Sox. 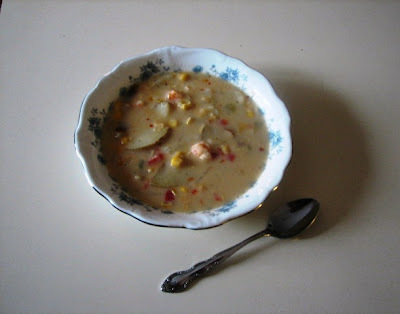 Mom leaves her laptop here in the family room and I was sick of seeing that shrimp chowder recipe as the current blog so decided I'd give you an update. It's really been pretty quiet around here lately. Dad is suppose to be working on the remodeling upstairs so we can get back on the road. He's decided instead to spend some time helping a fellow remodeler, Bo, finish a bathroom so that he, in turn, can help with our bathroom. That's good because Bo is our buddy and we like having him around, too. He and Dad do good work together. This has been an especially good month for me since Mom is doing her weight watcher's style eating which means that, at breakfast time, she usually has an egg yolk or two left after she makes her omelet. Not to wish my brother ill, but I'm glad he is allergic to chicken since that means I get the egg yolks all too myself!! Mom puts me in a separate room with my special treat so that Ditka can't sneak any. Then I just bark to let her know I'm finished and ready to come back out to play. I'm not sure I'm always getting the best end of this deal though since sometime when I come out I can smell cheese on Ditka's breath! Apparently Mom and Dad went out to charge up the batteries on the motorhome yesterday since its suppose to be back in to the single digit temperatures again for awhile here. They also ran some of the wiring to set up the motorhome for the DirectTV. 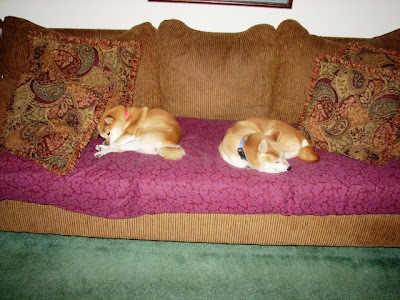 Although we miss the motorhome, Ditka and I didn't go with them since with both of them gone that leaves us a warm cozy house where there's no human to get in the way of a comfy afternoon nap on the family room couch. We're hoping it will only be about 2 more yucky bath times (I think thats about 6 weeks for you humans) before we'll be back on the road again, headed for warmer climates and those great long campground walks. I've been able to get a big thumbs up from Ken on another of my recipe renovations. This time I've redone Ken's Italian Sausage Soup so that is healthier with more fiber and less fat. I replaced the sausage with shrimp, used cleaned but unpeeled potatoes, and fat free evaporated milk instead of half n half. Also, none of the ingredients are out of the ordinary or need to be fresh from the store, you can pick up everything you need at Walmart and keep it around for when the mood strikes or when you are headed home and realize you have nothing laid out to cook. Warning: the red pepper makes this pretty spicy soup, which we like! If you aren't in to that reduce or eliminate that ingredient! This is a REALLY easy recipe for tailgating whether you are pre-gaming on the parking lot or in front of the TV!! In pot large enough to hold at least 12 cups, spray with cooking spray then saute onions, peppers and garlic until tender. 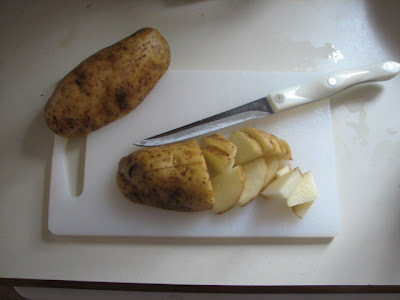 To keep the fiber and vitamins, clean potatoes but do not peel. Quarter the potatoes lenghwise and then make thin slices. Add potatoes, water, bouillion cubes and seasonings to onion mixture and bring to gentle boil, cooking until potato slices are tender, about 10 minutes. Add shrimp, corn and evaporated milk. Heat through. I like to transfer to crockpot at this point to keep warm on low. It seems to get creamier and yummier the longer its heated! I'm not sure with the milk and shrimp how well this would freeze and haven't had opportunity to try since its disappeared too quickly!! If you are not already aware of it, and are not a member of the online Weight Watchers website, please be aware that you do not have to pay to be a member of the basic site. It is free and contains loads of great information, forums and recipes. 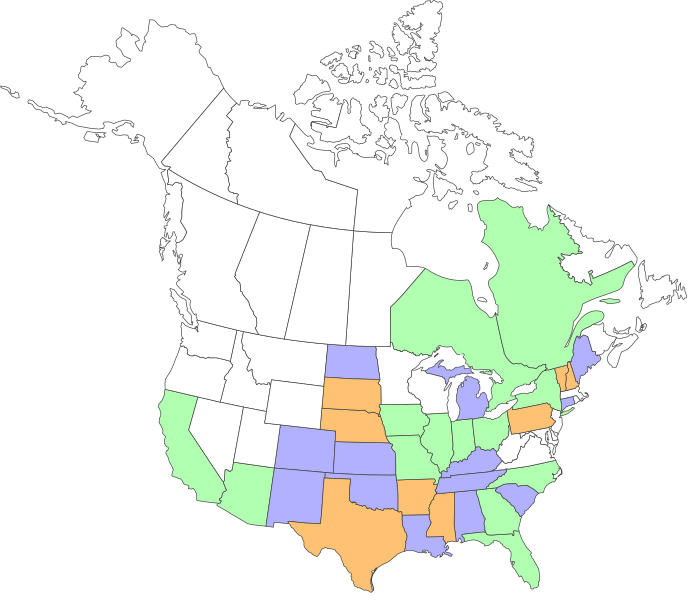 Yesterday, I uncovered some online WW users who are organizing a 'group' on this site specific to RVers on Weight Watchers. I think this is a great idea since there are some very specific issues that people 'On the Road' face with staying on program. With a 'group' you get your own discussion form and 'wall' (similar to facebook) where you can discuss related issues and give one another encouragement. You can also provide links to your own blogs. 3. This site is the place where meeting and lifetime members need to go to find meetings in the location where they are currently travelling so many are already using this. 5. This is a totally FREE interchange. The idea is that this can be done with no one having any ulterior 'money making' motives to get you to participate. So why push this!?! Well, studies have shown that people who have a support group lose significantly more weight than those who attempt to lose and maintain losses on their own. It's hard to have a support group when you are parked in a different state every week!! So, what better way to get that support than through a 'virtual' group of persons living a similar lifestyle! Ok, that's my sales pitch to try to bring in some new group participants! If you are interested and haven't got a WW signon, simply sign on to www.weightwatchers.com and follow the instructions to get a FREE signon. Then, once you have a signon, go to the 'Community' section and the 'Groups' section under Community. Search for a group with 'RV' in the title. You will find one called 'RV "On the Road"'. Follow the instructions to join and leave a note on the wall introducing yourself!! Also please, if you know some other RVers who would be interested please pass this on to them!!! With a good group attendance and interchange, this could be a very HEALTHY step forward in our RV lifestyle in 2010!! THE DRESS...and...What NOT to eat at Olive Garden!! 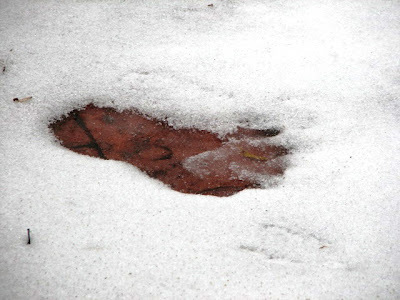 I took out the dogs Saturday and was surprised to see, by this footprint that was left in the snow on our patio, that we must have been visited by Sasquatch last night! The highlight of the day, however, was wedding dress shopping in Springfield. Jenni's mom, Donna, and I had to drive through thick fog both ways. Strangely, the fog seemed to leave up just outside Quincy on both the trip there and back. Nonetheless, the drive was a nice way for Donna and I to get some time together, just the two of us, since before our kids got together, we had never met...highly unusual in little ol' Quincy IL. especially when we both had kids at the same grade schools and high schools. 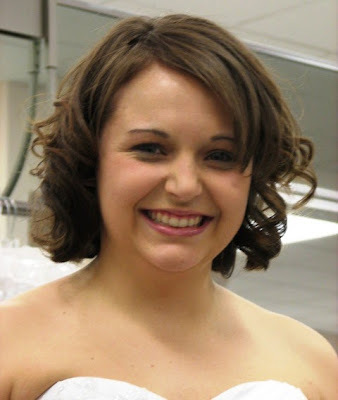 Jenni had already done some dress shopping in Carlinville but hadn't found much and so her next stop was in Springfield at David's Bridal. My experience with shopping for wedding dresses had been confined to small shops in Quincy so I was amazed at the difference at this shop. While the brides had appointments, there were no less than 12 girls trying on wedding dresses at the same time. 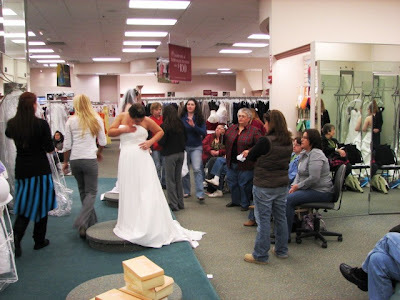 It was sort of an assembly line approach--sign in, get a consultant assigned to the bride, provide the consultant with the list of dresses by catalog # that you wanted to try on (the idea was that you had figured this out online and came to the store with your list of favorites--Jenni had 12). You were then assigned a dressing room and the consultant started tracking down the dresses on your list, hopefully with a match in close to your size. There were lots of ancillary sales pitches going on at the same time. Men's Wearhouse was there hawking their tuxedo rentals to the brides. And of course, David's has a host of wedding items besides the dresses to entice...wedding stationery lines, shoes, bags, jewelry, special bras, slips, headdresses....enough to keep a young girls head whirling. They have pedestals for the brides to stand on (lucky since all of Jenni's dresses were at least 6 inches too long!!) and couches and chairs for the 'judges'. Here's Donna, and Kate Abbott, one of the attendants who happens to live in Springfield, in the judges station. This was some of the best people watching we'd ever found and were totally entertained by all the people around us, from the gorgeous little twins dancing like ballerina's in the flower girl dresses they tried on, to the group of 'tough looking' individuals (ok, some we weren't sure of gender) who were helping this big tatoo-covered-motorcycle-mama pour in to an appropriate gown. But despite, the constant stream of modeled gowns, we three 'judges' were all in agreement that hands-down Jenni was definitely the prettiest bride in the store. The 'perfect' dress turned out to be about the fifth dress Jenni tried. But, of course, I'm not going to show it here--Kyle reads this blog!! ... and that smile said it all...this was THE PERFECT dress!! Although we were there specifically for the wedding gown, Donna and Kate did try on a couple of bridesmaids options. Now that Jenni has her dress, some new ideas started taking shape on dresses that weren't considered before but would complement the style of the wedding dress. I was surprised that one of the few opinions Kyle has expressed about his expectations for the bridal party was that the girls should definitely have long dresses and dresses that were all the exact same style. Jenni was pleased that he offered an opinion and more than happy to comply. Kyle also got attaboys from the other brides and the consultants who complimented Jenni on how pretty her engagement ring was. I did get a better appreciation for the unique Asccher cut diamond after having a look at some of the other rings flashing around the store. I was a bit surprised that the cost of the dress itself only made up about 60% of the total cost. Because of the way the bottom of the selected dress is made the alternations to shorten it will be considerable, then there are all the under garments needed. Finally there is the cost of having the dress preserved after the wedding. These were all things that we as a foursome considered necessary. That still leaves Jenni to work on a hairpiece, shoes and jewelry. While there are still those items to complete the wedding day ensemble, we all considered our shopping day a great success and decided, since none of us had lunch and it was already aftger 5pm, we'd do an early 'celebration dinner' at Olive Garden. This was a really nice way to end our day together but turned out to be a disaster to my Weightwatchers points. I had not eaten out since the new year since I am tired of seeing my budget and my waistline destroyed by the amount of restaurant dining that had slipped in to our lifestyle. I had assumed that we'd be finished looking at the dresses by 4:30 and would then likely be home by 6pm for dinner so I hadn't done any restaurant pre-planning which I've now proven is an important part of Weight Watcher success. I knew from past experience that Olive Garden Zuppa Tuscana soup was 3 points (less than a serving of their salad with dressing) and that breadsticks were 3 points each, not a problem. However, because I was HUNGRY and had not planned ahead, I decided to go with the same entree as Jenni, the Manicotti Fromaggio with Shrimp. Geez!!! When I got home and checked the Olive Garden Nutrition site, I not only found out that this entree had cost me 25 points, but that another entree I considered, the Venetial Apricot Chicken would have only been 7 points. This is the reason if you REALLY do weight watchers it REALLY works. You re-educate yourself on how to eat. You see, if I'm really honest with WW, then I know that I could have easily saved 18 points with one different choice that would have made absolutely no difference to my enjoyment of the dining experience. What does 18 points meam to those non-WW folks reading. Well that means I have to, for example, do 102 minutes of high-intensity Nordic Track to make up for that one poor choice. That is one heck of a lot of exercise!! That's why WW is a lifestyle change. You become educated on the impact of your choices and how simple adjustments can mean big differences. The other thing I KNOW but allowed to bite me this time is to PLAN AHEAD when eating out. My choice would have been different had I checked the nutrition values before we went to eat. When I have my laptop with aircard I can take a few minutes before I go in to a restaurant and makes these choices based on the nutrition info. A lot of successful Weighwatchers today are doing this with their iphones! But, I had been very good all week and so this one slip up will hopefully not have a major impact on my Monday weigh-in. I had, however, sent a 'hot text' to Kyle to warn him off the 'doggy bag' Jenni was bringing home when I realized the points that were in the half of the entree she had left. That apparently was good since Kyle's weigh-in was this morning (Sunday) and he is now down 14.6 lbs! Ok, I'm off for 34 minutes of Nordic Track, trying to make up for 1/3 of that Olive Garden entree mistake!! Starting to Schedule 2010 Adventures! Today, I made our reservations for the RV-Dreams Rally in South Carolina in April. That helps somewhat with the severe case of hitch-itch I've been experiencing! Last week, we finalized campground reservations for a trip to Bennett Springs State Park. We’ll be there with nieces, Sheila and Darlene and their families. The focus of the trip will be the fly-fishing that the guys do pretty much all day, while I get to go to the pool with the nieces and great-nieces. I still need to reserve sites at Fox Ridge State Park in May for Trevor’s graduation and again in October to enjoy the EIU Homecoming game. We also plan to attend Escapade in September in Goshen, IN and then hopefully a short trip to Tennessee to visit some fellow ‘RV-Dreams family’ in late October. We’ll start filling in the weeks between as the time gets closer. Ken has now picked up his tools again in our master bedroom. 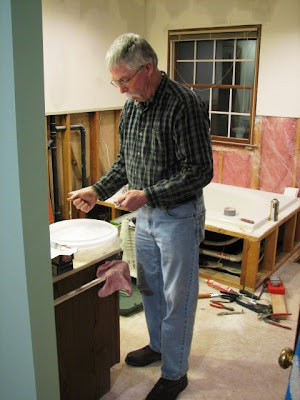 As you may recall, he completed most of the ‘destruction’ part of the remodeling and then when football season arrived, the project had to go to the back burner. 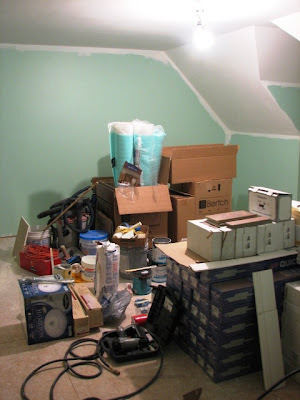 He now has most all of the materials carried up to the second floor with the new bathroom cabinets, the ceramic tile, the hardwood floors and all his varied tools taking up the better part of the master bedroom. The last few days have been spent primarily moving / enhancing some light fixtures in the ceiling and then patching and painting the ceiling. It looks MUCH better than the old ‘popcorn’ days. While Ken is staying busy on the second floor, I’ve established my winter ‘office’ in the basement.. Since I’m making weight loss/exercise my #1 job for the new year, the Nordic Track (34 minutes = 6 activity points!) is a key piece of equipment in that project. Ken gave me a light portable Brother sewing machine for Christmas so my current project is working through all the old quilts we have from Grandma Frericks that need repair. 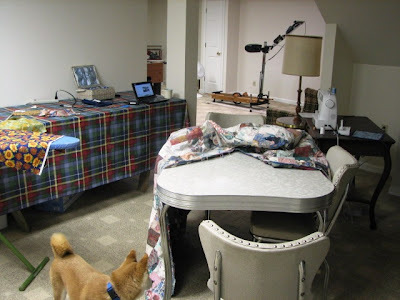 I’ve been recording the Ovation Channel ‘Tall, Dark and Classic’ movies that are on this month and then sit with my computer on one side and my quilt patches on the other and enjoy a movie while sewing patches on to the quilts.. Since we are two floors apart, I also keep the phone nearby so Ken call to request my assistance which usually isn’t exactly skilled labor since I’m usually holding ladders or passing him tools! 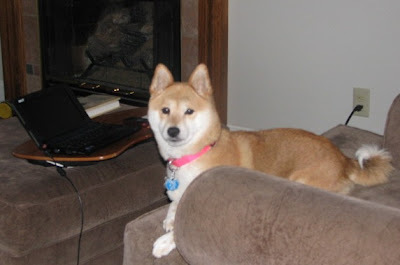 The Shiba’s spend most of their time with me since we don’t want them in the ‘construction zone’. 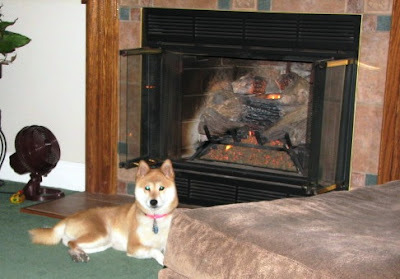 In the evenings, we all reconvene in the family room, with the fireplace going. That’s one of Sox’s favorite places to hang out this time of year. We’ll get a break from this routine on Saturday when I’ll be driving over to Springfield, IL with Jenni’s mother, Donna, to go wedding dress shopping with Jenni. I’m really looking forward to that! Hoping you all are getting a bit of a respite from the awful cold like we have! I think it is really cool that nowadays engaged couples can keep family and friends up-to-date on all the wedding details via their own free website. Besides the link above, I have attached Kyle and Jenni's website on the left of this website under 'General Information' so that friends and family don't have to recall multipole websites and can go there periodically to see updates as the details fall in to place. I am really impressed how much they have already completed. The church, reception site, hotel blocks, rehearsal dinner, wedding party dinner are all already set up. The planning highlight for me was Ken and I joining them and Donna, Jenni’s mom, to work with Julie at Country Inn and Suites on the details. Since between family and Carlinville friends they expect quite a few out of town guests, they prefer to have the reception at a hotel, limiting the amount of driving these guests have to do. Quincy has a brand-new and rather unique Country Inn and Suites with a beautiful ball room that can hold up to 500 guests. We met the owner who apparently has been in the hotel business for a long time and had some very specific special features he wanted to put in to this ‘pet project’ hotel. There’s a gorgeous staircase leading to the ballroom that will be great for pictures. The kids don’t really like the formality of a sit-down dinner and so are opting for buffet-style hors d’oeuvres. It's really not any cheaper than the sitdown meal but makes it a bit easier to stay less formal in terms of seating and what is served. We spent quite a bit of time talking with Julie about the variations of how the room could be set up and decorated and all the variety of ‘add-on’ costs to be considered (eg., should have at least one security guard, $x an hour; will need one bar attendant for free beer’/soda bar and one bar attendant for the cash bar – $x an hour each; will need room attendants for clearing tables, buffet, $x an hour, do you want a champagne toast at $x per person more; long table cloths, that’s $x per table more, do you need a wireless microphone for the master of ceremonies-oh, tell you what, we’ll throw that in.) I think Jenni’s hand was cramping just trying to make notes fast enough! Luckily she and Kyle will be getting a full written proposal from Julie so they can add/subtract costs as needed to stay to budgets. We checked out the guest rooms and with the discounts negotiated of $86 a night we think that it will be really comfortable for out of town guests, giving them big comfortable rooms, very nice facilities, and a hot breakfast for a reasonable price. In fact, I already know several 'in town' guests planning on taking rooms so that they don't have to worry about driving home after the reception. The bride and groom get a complimentary suite of their choice as part of the negotiated package. Julie took us to the top floor to check out the bar/lounge and the available suites. It’s been our experience that the wedding hotel guests and wedding party often gather in the hotel bar before the reception and often after as well. Since this lounge is very nice and stays open until 2-3am, I’m betting they’ll be some die-hards in there late that night. Now this is little ol' Quincy IL so I really wasn't expecting what we saw in the suites. WOW, they are amazing!! Marble everywhere, massive four poster beds, fully furnished kitchens, fireplaces, and bathrooms the size of our living/dining room combined. Kyle and Jenni chose the suite that has a huge dining/living/reception area so we can gather there on Sunday noon for gift opening. Julie said they wouldn’t have to be concerned about check out time. I think Julie and Jenni are going to become very good friends over the next 10 months with all the details. Ken and I joined Jenni and Kyle at Fuji Japanese Steakhouse for lunch after we left Country Inn and Suites. It was the first time Ken and I ate at Quincy’s newest and first Japanese restaurant. The food was very good and the chef quite entertaining. Of course, I don’t think this is a place you would make part of your regular eating out schedule since my impression is that the chefs’ performances are pretty scripted and I’m not sure I’d enjoy seeing the same thing and hearing the same jokes again and again!! After we finished eating, Kyle and Jenni stayed to discuss with the management setting up a wedding party meal at Fuji between the wedding and the reception. They have a separate room for this that holds 40 and has 4 hibachi grills so it looks like this will fall in place as part of the plan as well. They will make up a special 'Kyle and Jenni' wedding commemorative menu for the event that is in line with what they choose to budget for the occasion. The next major planning event will take place on Saturday, when Donna and I join Jenni in Springfield, IL as she goes dress shopping. Jenni has been really awesome about including me in all these fun events knowing that with 2 boys I otherwise have little chance to be part of the 'girly' part of a wedding which I find so much fun! (Niece Erin understood this as well and I had loads of fun joining her for dress shopping!). Donna will be playing double duty both as 'Mother of the Bride' and as 'Matron of Honor', so she'll be able to make some first choices with Jenni on bridesmaids dresses as well. I had never heard of a Mom as Matron of Honor before but apparently this is not uncommon and as a matter of fact 'Miss Manners' is quite complimentary of this practice (see link). Jenni and her mother are especially close and I think this is a wonderful tribute to that special bond. What fun I'm having with this!! Can't you tell! Yes, after 6 months of 'retirement', I have transitioned to really having fun days again in my life. I didn't realize how much I had lost that until I got it back!! As I mentioned in the last post. Kyle and I are both officially doing Weight Watchers. Kyle is doing the online 'Weight Watchers for Men' and I am doing the Monthly Pass which allows me to go to unlimited meetings and also gives access to the online E-tools. 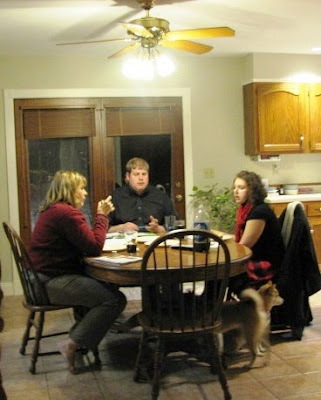 Since I know we are 'off the road' while Ken completes the second floor remodeling, this seems to be an excellent time to jumpstart my weight loss goal using Weight Watchers meetings. An independent study showed that people going to face-to-face meetings with such weight loss programs lose 3 times as much weight. I figure if I go and then pass on as much via email as I can to Kyle, who has no nearby meeting during a time he can make, he's getting the next best thing. Kyle's official online weigh-in day is Sunday. He's a week ahead of me and has lost 8 lbs already. That's ok though because he has more weight to lose. To reach our goals I basically have to lose 2 lbs to every 3 lbs he loses so while he got a head start I'm going to pushing him! My first meeting was this past Monday and that will be my official weigh-in day. The leader for Monday, Joyce, is someone I've known since childhood, gone through high school with and who has had children in school along side Kyle and Trevor. I was pleasantly surprised to see her as leader. She has lost 60 lbs and kept if off on Weight Watchers and does a very good job as leader. Since, I have the Unlimited Pass, I also go on Saturday mornings for an extra 'injection' of motivation. Sue, the leader on Saturdays, went to high school with me and has been with Weight Watchers for 10 years now since she lost 60 lbs. Sue has many years of experience and her Saturday morning meetings are always packed because she does such a good job. It's also a good mix of meetings for me since there are different dynamics in terms of type of participants on Monday versus Saturday. I try to make notes on things I've learned in the meetings so I can pass them on via email to Kyle. I'm also a sucker for catchy sayings...the one that got me this week was actually from Dr. Oz not Weight Watchers...."Vision without planning is hallucination". I researched and this is actually a play on a quote from Benjamin Franklin "Vision without implementation is hallucination"...hey, since as a 30-year project leader, I know you have to plan to implement, it all works!! One of the biggest challenges I've taken on, as part of this weight loss objective, is to try to develop a cache of Weight Watchers recipes that are winners with the men in my family without them feeling I'm putting them on a diet. I also focused on testing recipes I though Kyle and Jenni would be interested in, and that Trevor could replicate back at school. 1. My guys had to say they would like to eat it again. 2. The ingredients had to be something you could find easily...eg., available at Wal-mart, a store that all of us have access to. 3. The preparation/cooking had to be easy and something that could be done easily after work or school or could be in the crock pot while you were away. 4. I do give some preference to crock pot recipes since these are especially conducive to our RV lifestyle. Layered Mexican Chicken – I sautéed the chicken instead of boiled. Why boil out the flavor?? Definitely serve this with salsa. A 'mexican' salad of lettuce, onion, tomato on the side also is a nice compliment. Cabbage Roll Soup – the longer this cooks the better. Great for throwing together the night before, turning on in the morning and having hearty meal ready when you get home. I think the rice needs to be in there an hour though, not ½ hour. Fiesta Chicken and Black Beans – large batch that we ate one night over rice and the next day on tortillas. Served with a ‘mexican salad’ of lettuce, grated cheese, tomato, fat free sour cream as a side. My guys likes to combine the hot/cold items, really getting great Mexican flavor combo. Crockpot Sweet and Sour Chicken – Trevor bought himself a steamer/rice cooker so we did this over Jasmine rice from his cooker—really great. Spicy Sweet Potato Fries – these were a big hit but be sure you slice really thin and then get your fingers in there and all slimy to really get that egg white coating over all the surfaces. Ken didn’t get to try these since Trevor had them wiped out before Ken got there. Diet Coke Cake – this is a weight watchers standard and so easy, just mix a cake mix with a can of diet soda. The link is a discussion thread where they discuss variations and possible frosting as well. I simply did devil's food cake with 12 oz. diet rite cola and it disappeared before there was a change for any toppings. Broccoli and Cheese Quiche – my men will eat quiche!! Trev really liked this recipe and plans to do some experimenting adding lean ham, ground turkey, spinach and/or mushrooms. He also saw how easy it is to get a pie-crust almost as good as grandma’s from the Pillsbury crusts in the dairy case. I like these crusts over the frozen crusts already formed both for taste and because they take up less room in freezer/frig when in the RV. My stores don't carry small amounts of fresh dill so I used dried dill and it was just fine. Julienne Zucchini – really simple variation on zucchini that has lots of flavor and looks nice on the plate. Corn-meal Oven-Baked Catfish – I did with catfish nuggets that were on sale at our grocery store instead of the more expensive fillets and they turned out great. 1 1/2 lbs for Ken, Trevor and I and even though they ate a lot we still had leftovers so this is a good 'budget' recipe as well when the nuggets are on sale for $3.69 a lb. If you can't access one of these recipes let me know and I'll email it to you. While most recipes do not require you have paid access to the WW site, even those that do allow me the option of emailing to others without copyright infringement. I would suggest that you 'print' any recipe you see online that you want to keep since from experience I've learned not to trust that an online recipe page will stay around. To save any online content that I want to retain permanently, I use a free software, PrimoPDF, that you can download online. I then'print' such pages to my hard drive under my 'Recipes' folder. Since I don't like killing trees and want my recipes available when we are on the road where internet might not be accessible this has been a very valuable 'print' tool for me. I know a lot of my readers are weight watchers followers so I'd love to hear from you if you can recommend any recipes that your experience shows would likely meet the 'Man Test'! Sorry I haven’t posted lately but it’s been a very busy couple of weeks since Christmas. Kyle and Jenni went to Grandma Richmiller’s and Jenni got a BIG surprise. Her brother JP arrived from Afghanistan! Between the engagement ring and JP showing up for a surprise visit, Jenni said it was the best 24 hours of her life!! It’s our tradition to take in a movie at a theater on Christmas Day. This is usually the only time Ken and I go to the movie theater all year! When we arrived for the 4pm showing of ‘Sherlock’ we found out it was sold out—apparently a lot of people do Christmas Day movies! We opted to pick up a couple of DVD’s instead. We watched Hangover which was hilarious but we definitely don’t want Trevor hosting the bachelor party in Las Vegas after watching that movie!! We kept Inglorious Bastards for later viewing and went out to eat with Jenni’s family at TGI Friday’s, one of the few Quincy restaurants open on Christmas. It’s probably one of the few times between now and the wedding that we’ll have all 3 of Kyle and Jenni’s brothers will be in Quincy at one time so it was great to have a chance to get together. The day after Christmas I hosted my brother, sisters and their families for an evening get-together. Sorry, no pictures. Ken and I both simply forgot to pull out the camera. After that evening, we decided having a party the day after Christmas is not smart. It seemed that everyone was just too drained from all the activities of prior days to really enjoy yet another Christmas gathering. 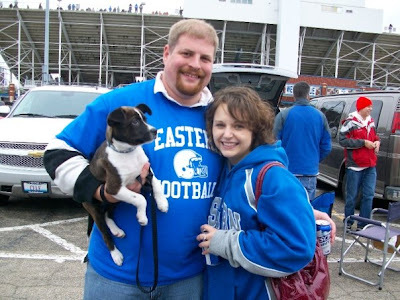 Jenni and Kyle were quick to start organize their wedding plans. We sat down to get a first-cut at number of guests and overall ideas. They’ve done a great job of pulling things together quickly. I’ll go in to more detail on all the fun I’m having helping them plan in later posts. Jenni also started putting together a wedding website. I’ll include a link from this site as soon as she’s had a chance to finalize the wedding party. Besides asking him to be best man, Trevor was also asked if he would act as master of ceremonies and put together the music and slide show for the reception. Trev is already having a lot of fun with this and spent many hours already over his Christmas break trying out different songs and sequences. On Wednesday, Trevor went to visit one of his former housemate and good bud, Jeff Sobel, spending their New Year’s Eve enjoy St.Louis nightlife. It appears St. Louis survived. It was certainly lucky that Kyle decided to give Jenni her ring earlier than originally intended, midnight New Year’s Eve. Jenni got sick New Year’s Eve and they had to leave their party early. I can only imagine how frustrated Kyle would have been had he still planned to give her the ring at the stroke of midnight and instead she was home sick in bed! Anyway. New Year’s was a quiet day of recuperation at home. 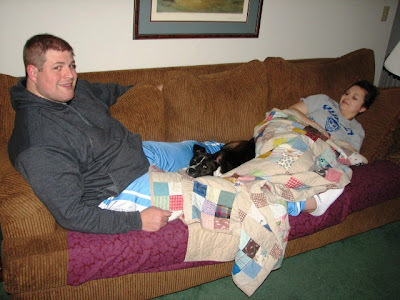 Even Staley seemed to understand that ‘Mama Jenni’ was under the weather and cuddled with she and ‘Papa Kyle’ on the couch. The first seven days of the New Year have flown by. We took down the inside decorations and, even with the single digit temperatures and snow cover, Ken convinced Trevor to venture outside with him to take down the outdoor decorations. We’ve had a couple of snows so its been nice to have Trevor home to handle most of the shoveling. Kyle and I have both joined Weightwatchers, he online only, but I’m doding both online and meetings. Although at last check he was at a very low percentage body fat, Trevor is also interested in dropping from his playing weight of 275 to something closer to 240 and so had done a great job of sticking with workouts and eating healthy. I’ve been trying new weight watchers recipes and I’m putting together a separate post of the ‘winning’ recipes, those that past the Frericks Man-Test for recipes.